BURBANK, Calif. (Feb. 22, 2017) — Lucasfilm’s “Rogue One: A Star Wars Story,” the first of the Star Wars standalone films, has established its place within the Star Wars universe and the hearts of moviegoers, becoming the seventh highest-grossing film of all time in the U.S. Fans can own the epic action-adventure thriller — nominated for two Academy Awards® — early on Digital HD and Disney Movies Anywhere on March 24, and on Blu-ray™ Combo Pack, DVD and On-Demand on April 4. Never-before-seen “Rogue One” bonus material will take fans behind the scenes with the movie’s diverse, dynamic cast and inspired team of filmmakers. An intimate collection of stories reveals how the film came to life, as well as hidden Easter Eggs and film facts that audiences may have missed in the theater. • The Princess & The Governor – See what it took to bring the vibrant young princess of “Star Wars: A New Hope” – as well as one of her most memorable foes¬ – back to the screen. 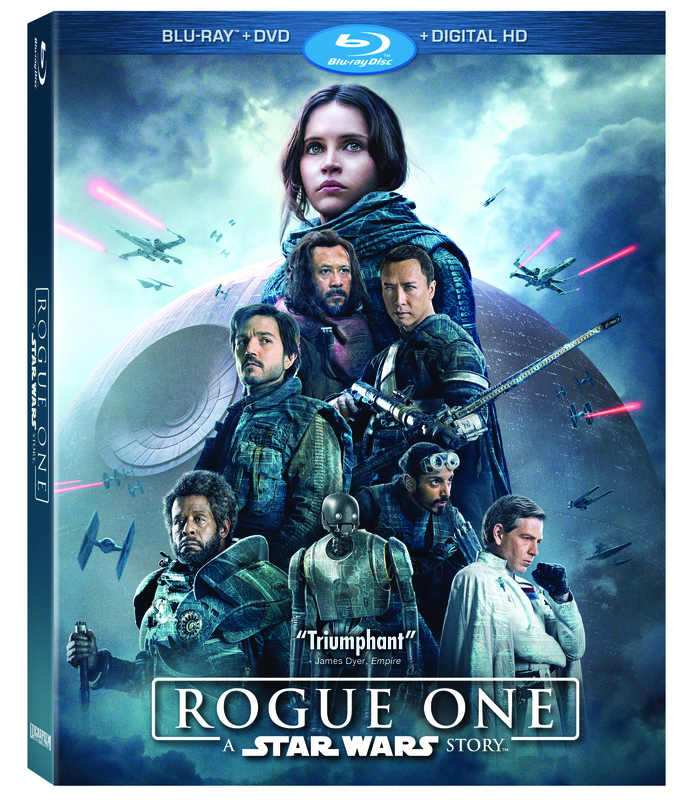 • Rogue Connections – Uncover Easter eggs and film facts hidden throughout the movie that connect “Rogue One” to the Star Wars universe. “Rogue One: A Star Wars Story” is directed by Gareth Edwards (“Godzilla,” “Monsters”) and produced by Kathleen Kennedy, p.g.a., Allison Shearmur, p.g.a. (“The Hunger Games: Catching Fire,” “Cinderella”) and Simon Emanuel, p.g.a. (“The Dark Knight Rises”). Veteran ILM visual effects supervisor John Knoll, (“Pirates of the Caribbean: Dead Man’s Chest) whom shares a long history with the Star Wars films, is executive producer alongside Jason McGatlin (“Star Wars: The Force Awakens,” “War of the Worlds”). The story is by John Knoll and Gary Whitta (“The Book of Eli,” “After Earth”), and the screenplay was written by Chris Weitz (“The Golden Compass,” “About a Boy”) and Tony Gilroy (“The Bourne Legacy,” “Michael Clayton”). Felicity Jones (“The Theory of Everything,” “Like Crazy”) heads up the cast and stars opposite Diego Luna (“Milk,” “Elysium”). Joining them are Ben Mendelsohn (“Bloodline,” “Animal Kingdom”), Mads Mikkelsen (“Casino Royale,” TV’s “Hannibal”), Alan Tudyk (“Frozen,” “I, Robot”), Riz Ahmed (“Nightcrawler,” “Jason Bourne”) and Forest Whitaker (“The Last King of Scotland,” “The Butler”). The film also welcomes two of China’s biggest stars, Donnie Yen (“Ip Man,” “Blade II”) and Jiang Wen (“Let the Bullets Fly,” “The Sun Also Rises”). In addition, Anthony Daniels (“Star Wars: A New Hope,” “Star Wars: The Empire Strikes Back”) reprises his role of C-3PO, marking his eighth appearance in a Star Wars film. To create the distinctive and contemporary look of the film, Edwards chose revered cinematographer Greig Fraser (“Zero Dark Thirty,” “Foxcatcher”). Visual effects supervisors John Knoll and Mohen Leo (Marvel Studios’ “Ant-Man,” “The Martian”) team up with special effects supervisor Neil Corbould (“Black Hawk Down,” “Saving Private Ryan”) and ILM animation supervisor Hal Hickel (“Pirates of the Caribbean: Dead Man’s Chest,” “Iron Man”). Star Wars veteran Doug Chiang (Star Wars Episodes I and II, “Forrest Gump”) and Neil Lamont (supervising art director on “The Force Awakens” and the “Harry Potter” film series) join forces as production designers, and Neal Scanlan (“Prometheus”) returns to do special creature effects, having recently worked on “Star Wars: The Force Awakens.” Additional key crew include costume designers Dave Crossman (costume supervisor on The Force Awakens and the “Harry Potter” film series) and Glyn Dillon (“The Force Awakens” and “Kingsman: The Secret Service” costume concept artist), as well as stunt coordinator Rob Inch (“The Force Awakens,” “World War Z”). The music is by composer Michael Giacchino (“Star Trek Beyond,” “Zootopia”), with original Star Wars music by John Williams. The editors for the film are John Gilroy, ACE (“Nightcrawler,” “The Bourne Legacy”), Jabez Olssen (“The Hobbit” trilogy) and Colin Goudie (“Monsters”). “Rogue One: A Star Wars Story” is directed by Gareth Edwards and stars Felicity Jones, Diego Luna, Ben Mendelsohn, Donnie Yen, Mads Mikkelsen, Alan Tudyk, Riz Ahmed, with Jiang Wen and Forest Whitaker. Kathleen Kennedy, Allison Shearmur and Simon Emanuel are producing, with John Knoll and Jason McGatlin serving as executive producers. The story is by John Knoll and Gary Whitta, and the screenplay is by Chris Weitz and Tony Gilroy. “Rogue One: A Star Wars Story” opened in U.S. theaters on December 16, 2016.